Unlock content on schedule and send your learners notifications when something's due. Teachers who schedule due dates have much more success keeping everyone on track to complete a course than those who don’t schedule dates at all. Completion rates for groups with due dates are often 60% higher than groups who just move at their own pace. Open a Group to the Path and make sure you're in "Teach" mode. 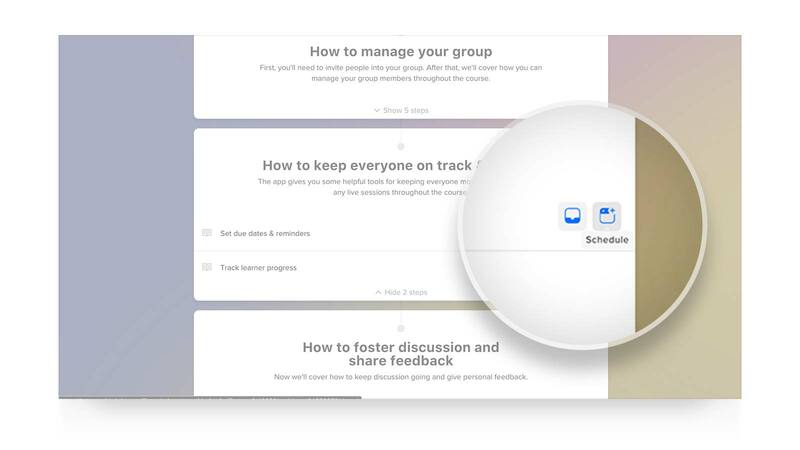 Hover over a Lesson or Step and you'll see several icons appear. Select the "Schedule" icon to set Start and/or Due dates. Once you set a due date, learners will see it on their path. Anyone who hasn’t completed the step 3 hours before it’s due will get a reminder email with a link directly to the step. If the step is overdue, then they’ll get another email letting them know that it’s late. Learners can manage their notifications if they need to make any adjustments. You can select the Schedule icon on either a Lesson or a single Step. Setting a date on an individual Step will override the dates set on the entire Lesson and vice versa, so you may want to start with the Lesson and edit individual Steps later. Start and Due Dates on Lesons: If you select the Schedule icon from a Lesson, you can set start and due dates that affect all the steps in the Lesson. To edit or remove dates, just open Schedule, make your edits, and save. Start and Due Dates on Steps: If you select the Schedule icon from an individual Step on the Path, or open a Step and select the Schedule icon in the upper right corner, the dates you set will only affect that one step. When you open Schedule, you will see two options: Start Date and Due Date. If you set a start date, learners will be locked out of the step until the start time is reached. Click on the time (12:00 AM is the default) to select a different time of day. Learners will see the time you set in their own timezone. Learners will see a message that the step is locked if they try to access it before the start date is reached. The notice on the step will count down the days, hours, and minutes until the step opens.